One day, I would like to call myself an artist. 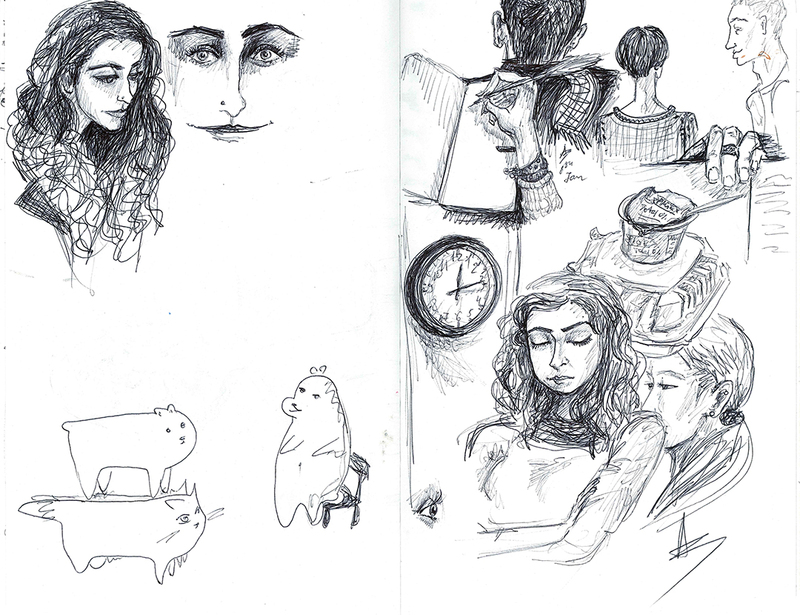 Here are some of my sketches from my January term, which I spent in New York this year. It was a great experience, because New York has that strange, neo-romantic spirit of a post-modern megalopolis, which gets mixed with the still-alive spirit of twentieth-century USA, echoing jazz, hipsters, beatniks, hippies and a gazillion of other great and poetic (in its inner nature) things. This place represents the idea of diversity, though New York’s cosmopolitanism is different from the diversity I was exposed to back home (Russia). 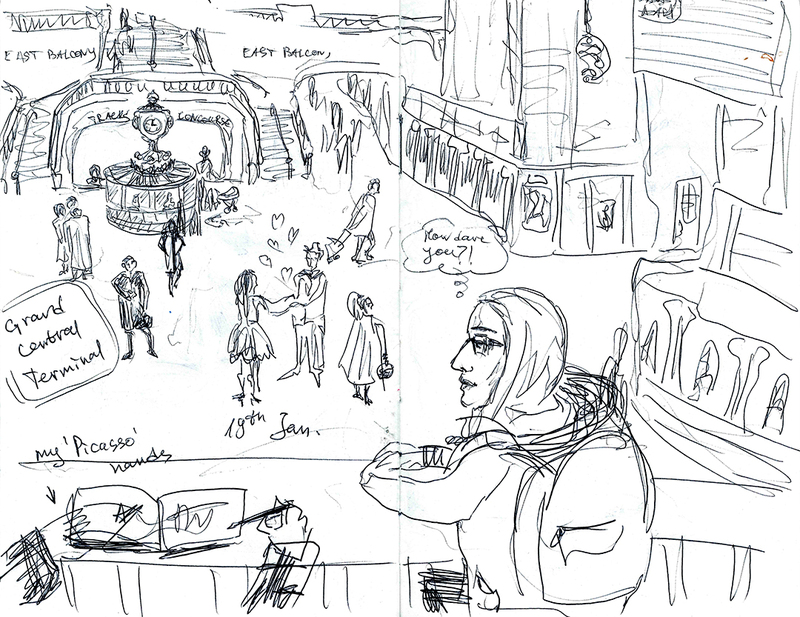 I enjoyed every second I spent in this busy, technologically upgraded, story-filled city. This January marked my first time visiting the United States. I had some expectations of New York before going there, formed by pieces of popular media. Among them were: Carrie Bradshaw’s Manhattan, Friends’ New York, MoMA, Metropolitan, and Broadway. 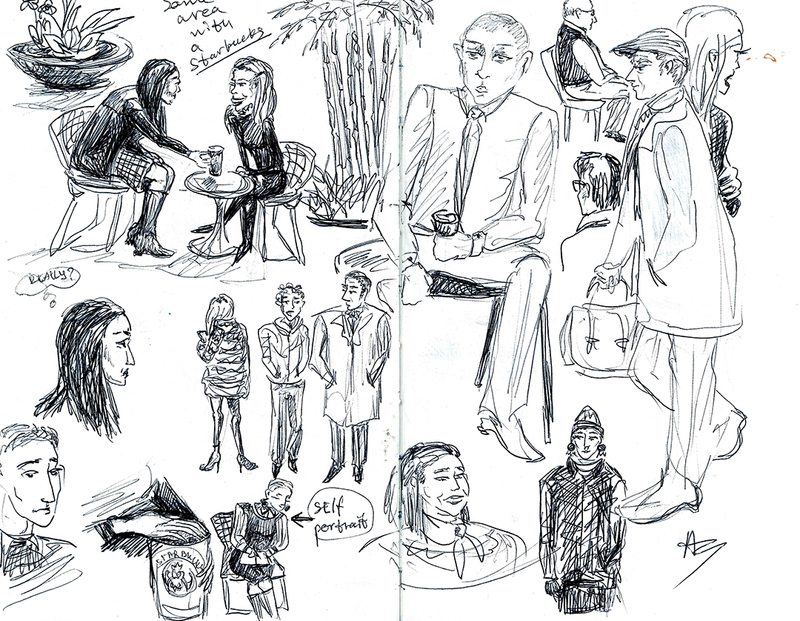 I tried to sketch everywhere, even while walking on the streets. Because I did not have a camera and this was my way to create nice memories. 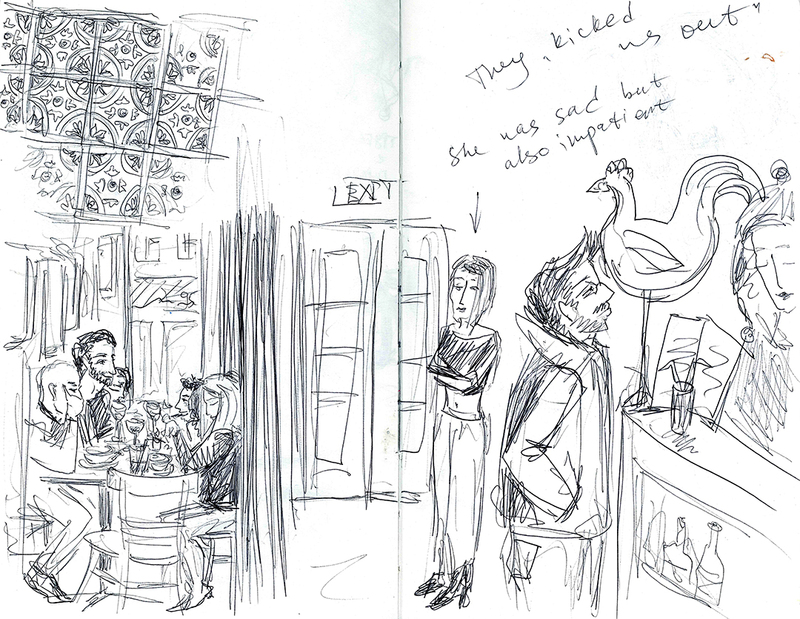 We got kicked out of Grey Dog Coffee at rush hour; we hung out in Vapiano, with its fabulous interior and surprisingly affordable prices; we visited Rockefeller Center; I sketched magical creatures inspired by rats in the subway; beautiful strangers, my classmates, places of interest, reflections, dialogues, yellow cabs, dogs, the gorgeous Strand Bookstore (where we spent a fortune) – everything is on the pages of my New York’s sketchbook. 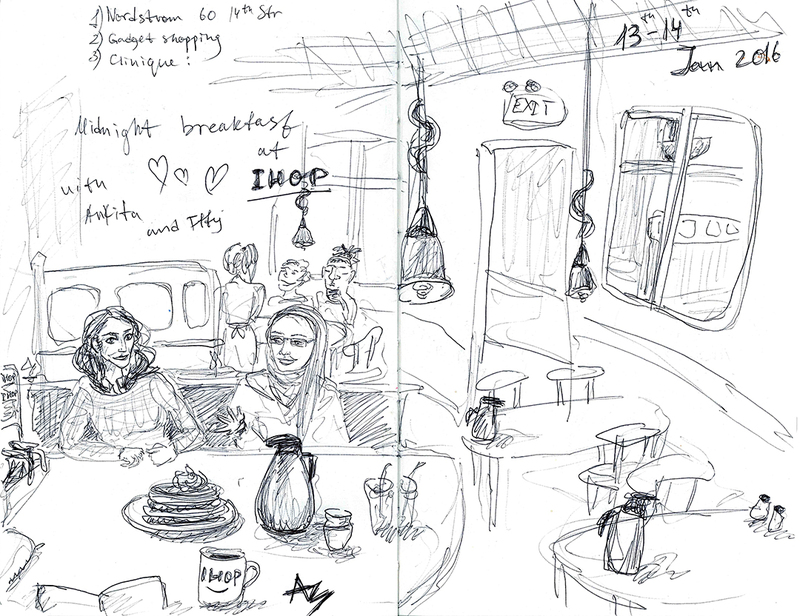 Here is my first set of New York sketches. 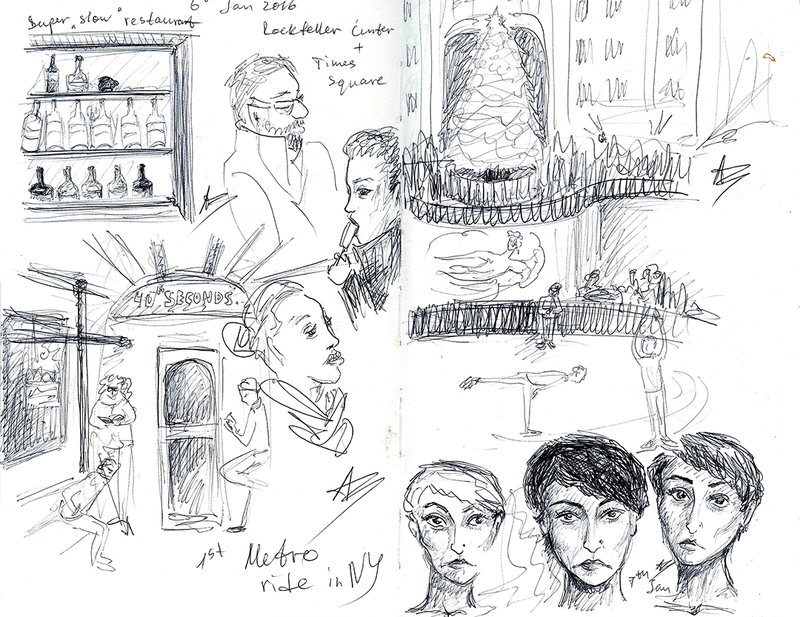 It features Rockefeller Center, where we saw the huge Christmas Tree and listened to the soundtrack from Home Alone, as well as some people I sketched in the subway and three versions of my roommate Helina. All graphics by Anastasiia Zubareva. Here are my classmates, a cartoon we watched while waiting to go to a museum, and my humbling-real-student-saving-money-for-Broadway-and-museums lunch (plain yoghurt and 150g veggies) grabbed from the grocery shop near by, recommended by our professor, Eliot Borenstein. 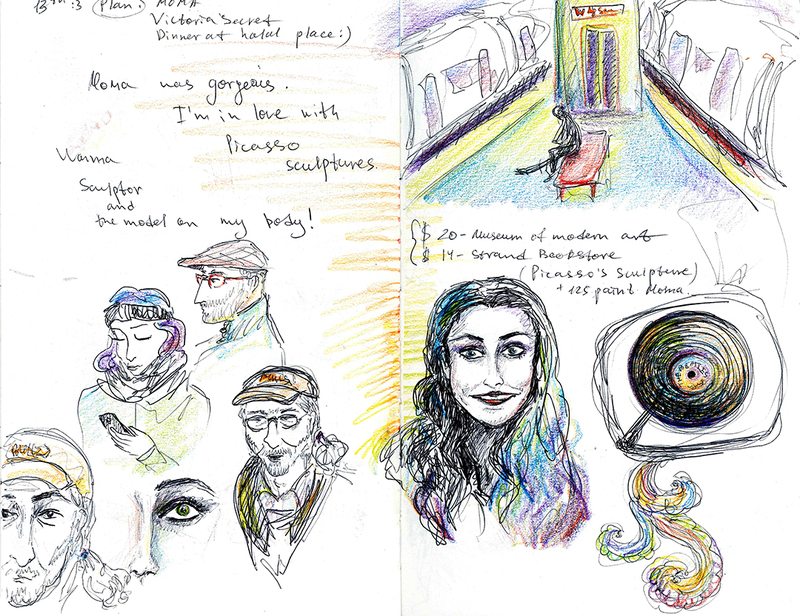 More subway sketches and the colorful portrait of smiling Ankita. That day we visited MoMA and I was melting from happiness, inspired and excited. 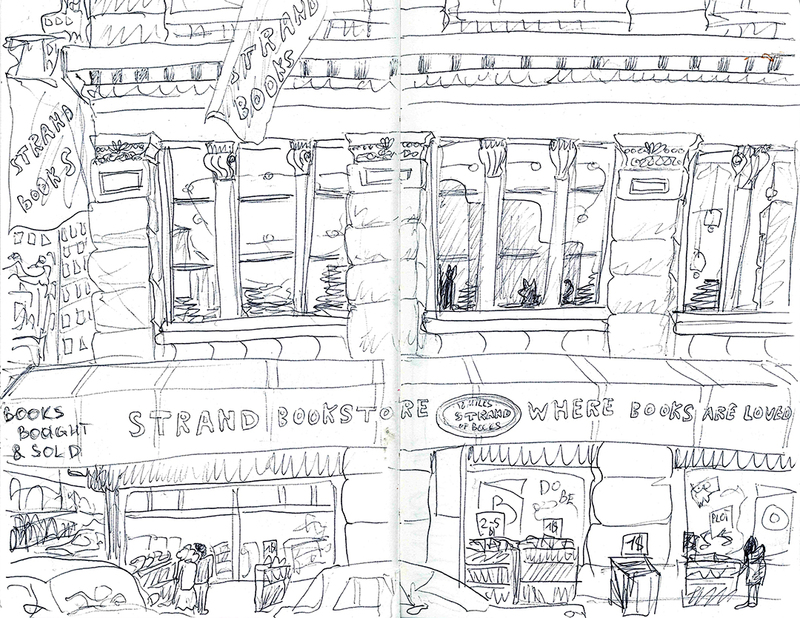 18 miles of books – Strand Books. The best place to go after Broadway and the museums. The $1 books were awesome! I struggled a lot at the end of J-term, though, because I had at least 7 kg of them. I am in love with with this place. 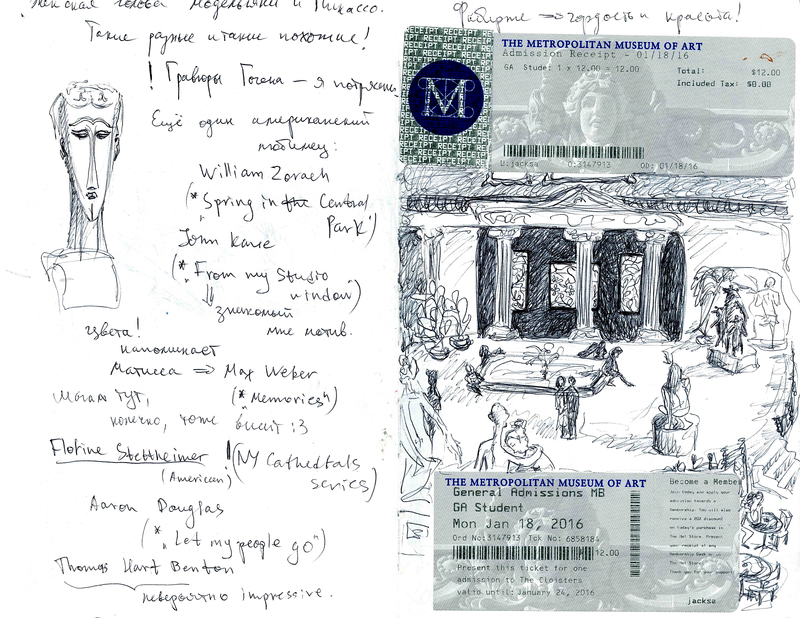 Want to live there… The Metropolitan Museum of Art! Modigliani’sWoman’s Head and one of the halls of the museum with the garden of sculptures. Grand Central Terminal’s hall: Ifadha and I witnessed the sweetest moment of proposal there. Here we are killing time before a performance of “Wicked” on Broadway that evening. Vapiano is an Italian restaurant with awesome food and interior design. Surprisingly, it was reasonably priced even for college students. New York dogs are super cute, as are cats. Their owners were pretty friendly. 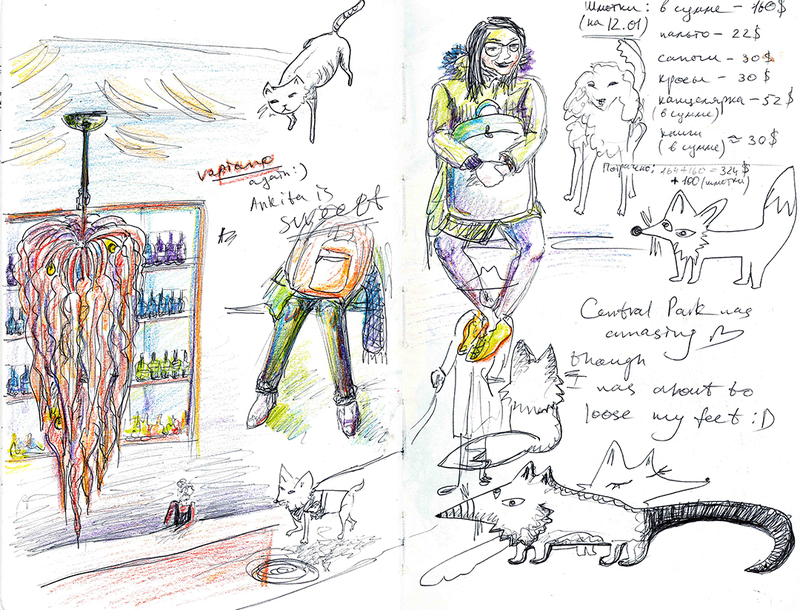 The weird creature in the right lower corner was inspired by huge and funny New York rats (especially those in the subway). And, yes, hold your bag tight unless you want to donate it to the stranger. Anastasiia Zubareva is a member of the NYUAD Class of 2019.